Due to the volume and repetitive nature of log data it's hard to actually review it and spot issues - relevant things are lost in the flood of normal even looking at the logs from a single laptop. We built a small tool called uno, that's like uniq but for logs which helps you filter out the normal and only outputs things that are new - i.e. anomalies. Proof-of-concept: plugging in a USB memory stick and seeing uno immediately highlight this new event, see video. This turned out to be a great way to illustrate the core concept behind Unomaly: taking a stream of logs and separating it into normal and anomalous. Over 200 MB worth of log data in just in one day. And I haven't done anything more spectacular than listening to music, coding, writing a blog post and of course some Facebook browsing. Now, let's say something actually happens: I pair with a new Bluetooth device or my SSD starts going bad – how would I spot this in the logs? I couldn't possibly review the full dataset daily. Looking at a sample of the logs it's obvious that there is both repetition and structure in this data – similarly structured messages repeat with different parameters, dates, numbers, file names, etc. This seems like a great candidate for some automation, let's see what we can do! To start out I piped my laptop log stream through uno. To see the effect I'm showing the unfiltered log stream on the right and the one filtered through uno on the left. We should expect the left one to get quieter over time as repeating lines are suppressed. uno filtered away 96% of the data. How can 13674 events be reduced to 514 distinct types? Well, the number of logs generated by a program over time is unbounded while the number of log statements in the program that creates those logs is finite and typically orders of magnitude smaller than the generated log volume, over time. Now, let's return to the originally posed problem: how can we spot anything out of the ordinary in this log stream? 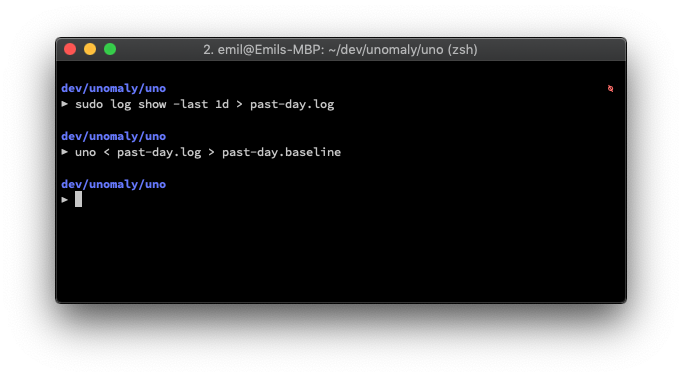 To do this, I want to feed uno a large amount of logs to get a good baseline – i.e. making sure it has seen most of the normal logs and hence will not output them anymore. 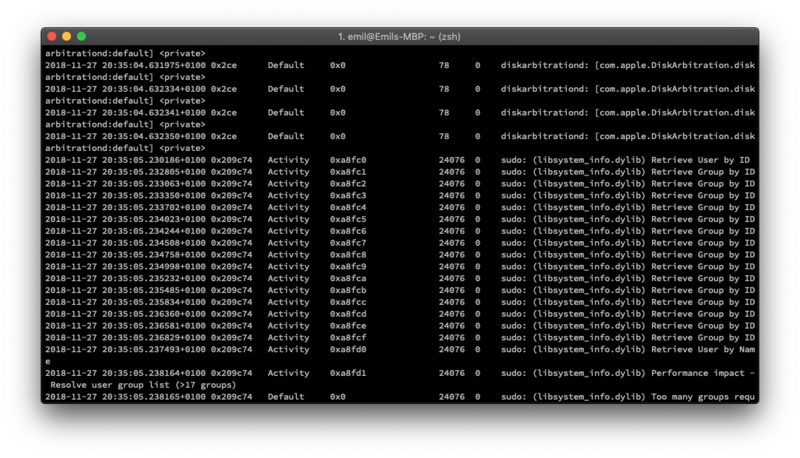 So I took the days worth of logs from my laptop, ~1.4M events totalling 209 MB and fed it through uno. I saved the resulting 12,495 distinct log lines into a baseline which can then be preloaded when we feed it the live log stream. As expected, when I start uno with the baseline and don't do anything with my laptop, it is almost silent since everything that comes in has been seen before. What is lost in the noise on the right clearly stands out on the left where we've filtered out all the normal stuff. Just through a glance one can see that "something with a USB memory" has happened – enough to get our attention and look into it. The remarkable thing is that we did with this without any hardcoded knowledge of what to look for. This was highlighted by just filtering away the normal and looking at the remainder, or the anomalies. What is the first question you ask yourself when investigating an issue? What is different from before? Back when it worked as intended. Troubleshooting is largely a process of repeated elimination of irrelevant data in order to single out what is different. But you don't know what that something is so you can't search for it! This makes it time-consuming and hard to perform as a proactive measure. Notifying: Since you're alerted of anything unusual you have better chance of being proactive and spotting issues before they have consequences. Change management: If you know that there will be changes, e.g. during a deploy, you can look at the anomalies output to immediately see the effect of those changes. Profiling: The baseline is essentially a taxonomy of your log data and what is normal which can help getting a picture of what goes on in your systems. And, most importantly, note how this is possible without keeping your monitoring in sync with your log producers – as in having patterns for every log type that is received, or rules for alerting on errors. For internal software this means constantly keeping up with the development team and knowing what signals to look for. In a world of distributed teams and continuous deployment this is a major point of failure: it will be overlooked, and it incentivises being resistant to making changes in the first place. This way of looking at log data in terms of anomalies is what Unomaly is built around and we'll explore the concept more in subsequent posts. How does uno relate to Unomaly? uno is a free barebones CLI tool that we first built to illustrate the core concept of Unomaly. It uses a different algorithm, but hold tons of value on its own. Also, it's great fun to play around with. Tip: pipe your dev logs through it. We'd love to hear your comments! You can tweet me @svammel (post and demo author), or @alexandrepesant (uno author) or any of our colleagues @unomaly.